Renowned plant machinery dealership Applied Machinery has recently installed a new Hurco CNC vertical machining centre at Custom Plenum Creations in Wollongong, New South Wales. Applied Machinery, one of the oldest and most respected dealers of new and used machinery in Australia, has recently installed a new Hurco CNC vertical machining centre at Custom Plenum Creations in Wollongong, New South Wales. Custom Plenum Creations, a fabricator of automotive parts including high performance intake manifolds, is owned and operated by Ariel Banco. The VMC machine was purchased to assist in production of the modified intake manifolds, converting what used to be a manual process to a fully automatic one that massively speeds up the production process. Custom Plenum Creations designs and modifies intake manifolds for all types of engines including cars, quad bikes and jet skis — essentially anything that is petrol or diesel powered. The modifications produce a significant boost in power. The selection of the Hurco machine was based on Banco’s own personal research and feedback from other CNC users. 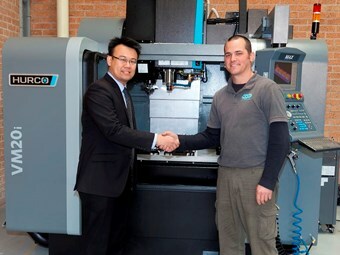 The exact machine, a Hurco VM20i four-axis model, was selected after lengthy discussions with Applied Machinery over an extended period of time. The comprehensive training package that Applied Machinery provides with all new Hurco machines provided Banco with an insight into the machine’s many capabilities and features. One of the things that Banco expressed delight with initially was the machine’s user-friendliness. "For someone that had never used a CNC machine before to be able to program it from day one is testament to just how easy the Hurco machine is to use," he says. "The efficiency that the new Hurco machine brings is literally staggering. I simply take the design I have prepared on my computer, program it into the machine, set it in motion and walk away. The machine then carries out the modification while I can get onto other jobs. "Aside from the huge productivity and efficiency gains, another key benefit of the machine is that it allows for far greater accuracy and repeatability. The machine can continue to do the same thing over and over again which allows me to build up stock levels thereby allowing me to supply customers immediately." Banco reports that throughout the whole pre- and post-purchase process Applied Machinery’s service has shone through. From the initial answering of numerous questions through to the actual delivery of the machine he has found the service from Applied Machinery outstanding. "Since I’ve had the machine delivered back in early July I’ve had two other representatives from Applied come out and check up on how the machine is performing. That’s just great service," he says. "Quite simply, the Hurco VMC will allow me to produce the very best intake manifolds without any compromise." With the many benefits the Hurco Machine has already provided, the future is looking bright for Custom Plenum Creations. For more information, contact Prashant Gokhale, CNC Machinery Sales Manager, on 03 9706 8066, e-mail prashant@appliedmachinery.com.au or visit www.appliedmachinery.com.au. MULTI PROCESS MIG TIG MMA HIRE ESAB, LINCOLN & CIGWELD. VERY COMPETITIVE RATES. VANTAGE HIRE VANTAGE 400, 575, AIRVANTAGE 500 VERY COMPETITIVE. CIGWELD HIRE MULTIPROCESS INVERTER 500I VERY COMPETITIVE.